The Superman Fan Podcast: Episode #382 Part IV: Superman Family Comic Book Cover Dated May 1965: Superman's Girl Friend Lois Lane #57! Superman's Girl Friend Lois Lane 57, May 1965! SUPERMAN'S GIRL FRIEND LOIS LANE 57, May 1965, was published on March 25, 1965. It contained 32 pages for the cover price of 12¢. Mort Weisinger was the editor, and the cover was drawn by Kurt Schaffenberger and lettered by Ira Schnapp. It featured the issue's first of its three stories. - (12:26) LOIS LANE -- SUPER-BABYSITTER (9 p[gs. ), written by Leo Dorfman, pencilled by John Forte and inked by Sheldon Moldoff. - (26:56) THE RETURN OF LOIS' MONSTER SWEETHEART (8 pgs. ), written by Edmond Hamilton and drawn by Kurt Schaffenberger. This story was reprinted in SUPERMAN'S GIRL FRIEND LOIS LANE 113, September/October 1971, published on July 6, 1971. It contained 32 pages for the cover price of $1.00. - (39:38) LETTERS TO LOIS column. - (44:42) THE CAMERA FROM OUTER SPACE (8 pgs. ), written by Otto Binder and drawn by Kurt Schaffenberger. - (59:57) Elsewhere in DC Comics, 26 titles carried the May or May/June 1965 cover date, according to Mike's Amazing World Of Comics. Next Episodes: SUPERMAN FAMILY COMIC BOOKS COVER DATED JUNE 1965: PART I: SUPERMAN'S PAL JIMMY OLSEN 85, PART II: 80 PAGE GIANT 11 (starring Superman), PART III: ACTION COMICS 325 & PART IV: WORLD'S FINEST COMICS 150! 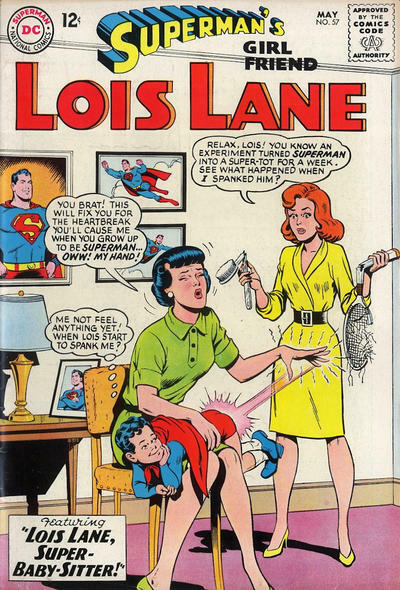 In "Lois Lane -- Super-Babysitter", I love the idea that Lois and Lana both assume that the super baby must be Superman, de-aged by Superman's experiment gone wrong. I guess, based on how often things like that happened in the Silver Age, the assumption is justified, but they never even considered any other possibility, even though the Silver Age was full of all sorts of possible explanations, like magic, other-dimensional imps, Red Kryptonite, a baby Bizarro (Didn't Bizarro babies start out life looking like normal human babies? ), a shape-changing alien admirer of Superman, etc. In any case, each woman decided this was the perfect opportunity to brainwash the supposed Superman into marrying her once he was restored to his normal self. Now, there's a solid foundation for a happy marriage! In "The Return of Lois' Monster Sweetheart", it was good to see Herko again. I still remember that heartbreaking moment from his first appearance, when he was shown pining for Lois after he'd returned to his home. I'm glad Herko ended up with a good match. He deserved better than Lois, I think.